With the weekend on, I wanted to make something for the kids that they will be interested in. They naturally love chocolates and the moment I said I was going to make chocolates, they were after me to make it right away for them. But time flew and I had no time to make it. Since I was off for lunch, I couldn’t finally make it. So decided to make something else that they will still love. 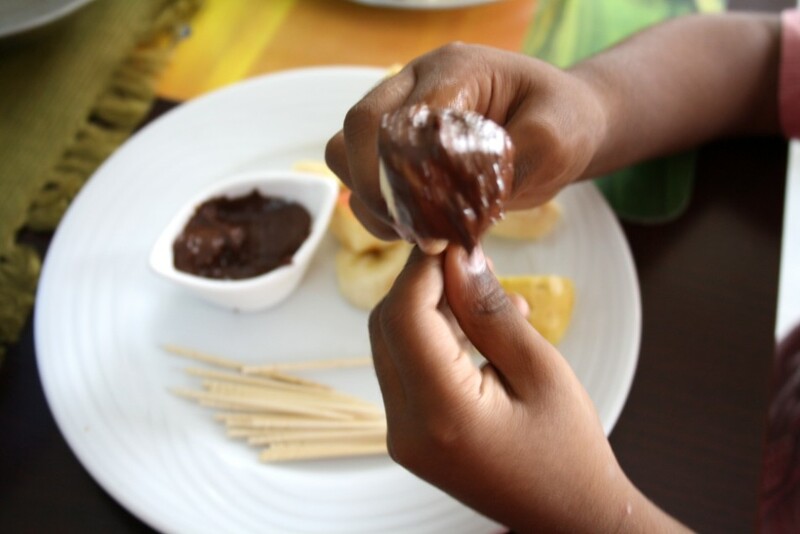 These chocolate dipped fruits made a great thing for the kids to make it themselves. As I had to stick to the theme, I had to use nutella. 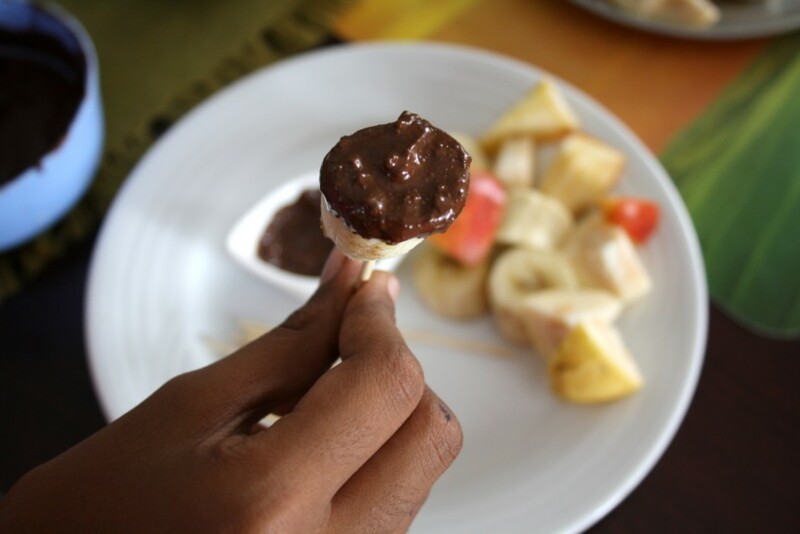 But melted chocolates make a great fondue for these seasonal fruits. 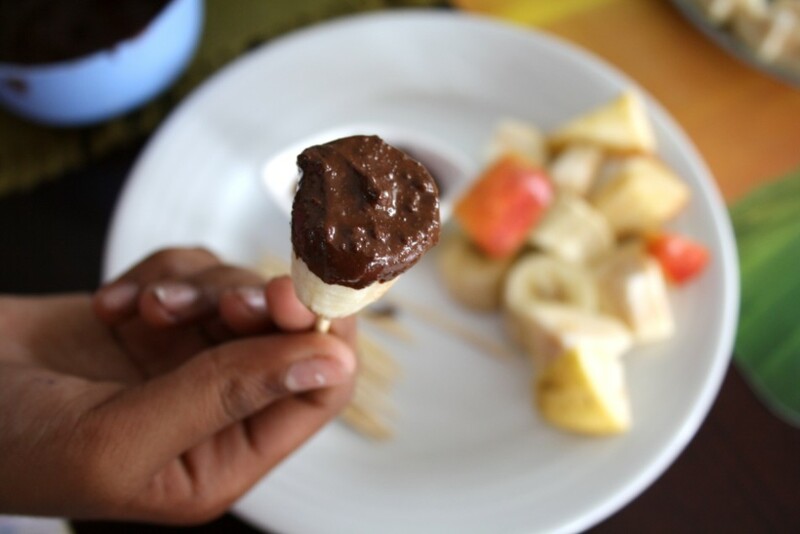 Once you dip these fruits, you can even freeze them and they make a great pops. I had the fruits all cut into small bites, had both nutella and chocolate for them. Each made their own choice. This was Konda making a pop with banana. This was the plate that was served to them. Konda had another one to make for herself. This was Chinnu trying with banana. Then came Peddu, he was really confused on what to select, Guava or Apple. Guess what he made both! 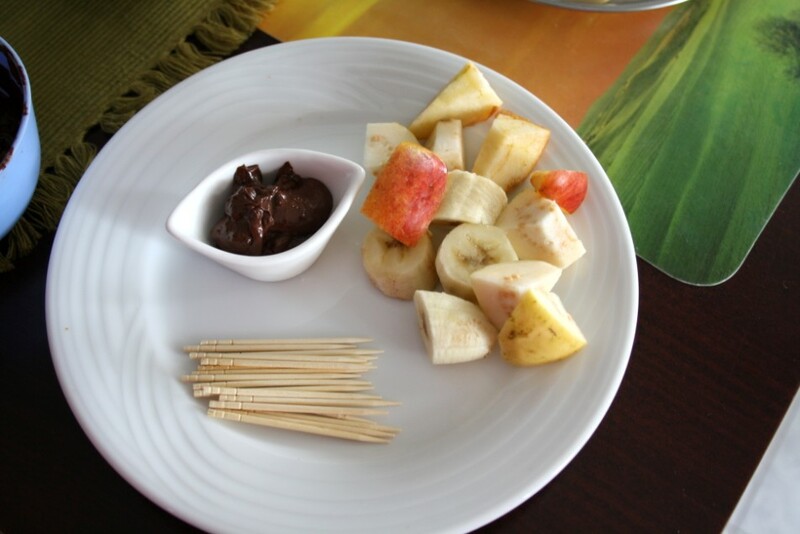 Dip these fruits into chocolate and freeze them by storing in the glass and freeze. Those frozen pops makes a great snack! 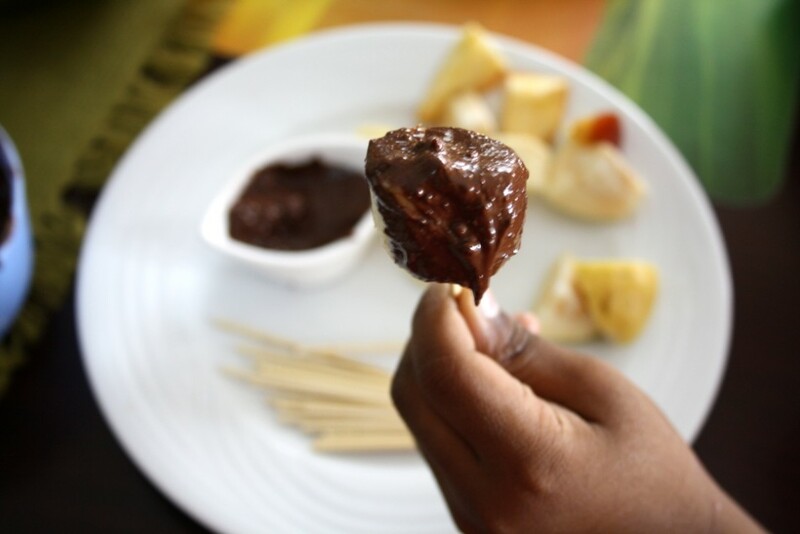 You are wondering why I call it fake, well because I used Nutella for the dip! I am happy to say I have successfully finished one week of cooking without fire for kids, you won’t know how delightful it has been making these and enjoying it myself. Of course with these Konda felt she will be called more frequently to help, well that needs to be seen. ha ha ha….this is so cute…love these little bites ,n love the way the kiddos have posed for them…children always bring a smile to our faces…Bless them!! 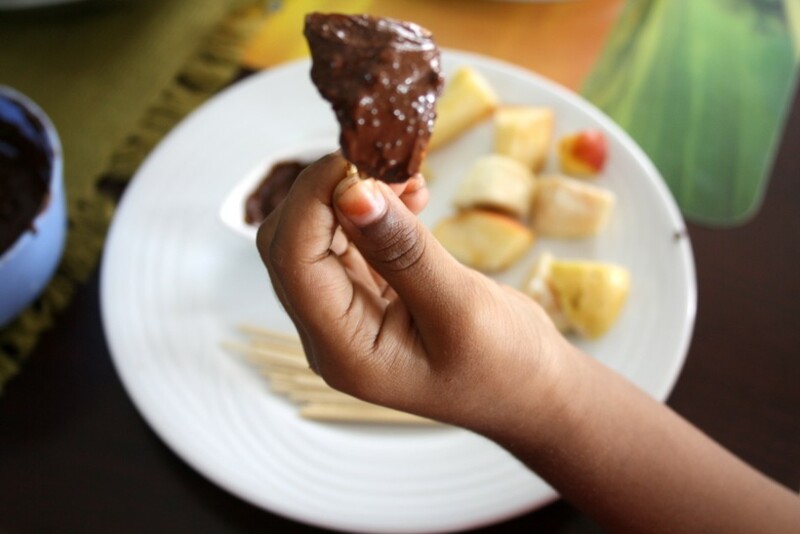 yumm …and nice way to make kids eat fruits! that is an interesting way to dress up the fruits for the kids!! Look superb and a very good recipe for the kids!!! Wow wat a wonderful pops, seriously am drooling..
Great recipe!! Liked it very much. Will try soon!! nice idea for a kids party Valli..